…the set of special characteristics that the geography, geology and climate of a certain place, interacting with the plant's genetics, expressed in agricultural products such as wine, coffee, chocolate, tomatoes, heritage wheat and tea. The concept has also crossed to other Protected Appellations of Origin (PDOs a form of geographical indication), products such as cheeses. 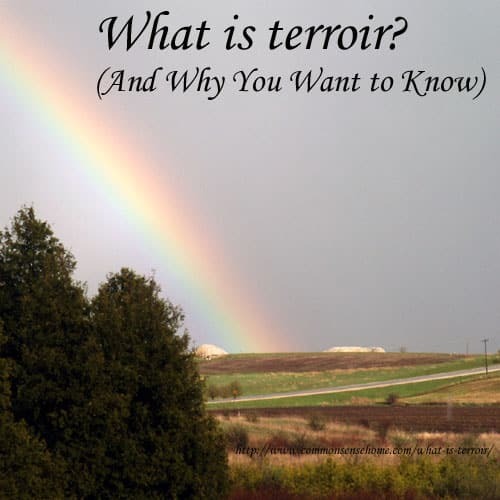 Terroir can be very loosely translated as “a sense of place,” which is embodied in certain characteristic qualities, the sum of the effects that the local environment has had on the production of the product. Terroir is often italicized in English writing to show that it is a French loanword. Most frequently, it is used to describe grape and vineyards, but once you start poking around in foodie circles, you'll hear it applied to a wider variety of foods, such as those listed in the Wikipedia definition. I live just a couple of miles from a winery called Parallel 44. They chose the latitude because it includes many of the great wine making regions of the world, and they chose the specific site for the soil and gentle south facing slope. By this point, you may be thinking, “But I don't grow grapes or any of those other crops.” If you garden (or even if you only eat what other people grow), you have experienced terroir. In the homestead garden, most gardeners have noticed how much better their own freshly picked produce tastes than store offerings. There are few things better than a sun-riped, juice dripping tomato or strawberry fresh off the vine. *That* is terroir. The better your growing conditions, the more flavorful the food you grow will be. Of course, once in a while terroir bites you in the tail. Some plants simply will not thrive in some soils. Alkaline, high nitrogen soil will lead to scabby potatoes (work in leaves to help drop your pH). Strongly alkaline soil will stunt blueberries (pine needles make a great blueberry mulch). In my garden, I can't grow sweet onions. I can plant sweet onion varieties, but I have so much sulfur in my soil that the onions always come out very strong flavored. In these cases, you can either grow in pots are work on a major soil makeover, or you can focus on crops more suited to the soil you have (or learn to like stronger onions). We’re using a combination of three oils on the toe – frankincense, On Guard (blend) and Melalueca. he had a slice of his toenail cut off to try and give more room (since it was ingrown, which is how the infections tarted), and it never healed up properly. It was angry and red all the way around the nail when we started with the oil, now the redness is really confined to the original side, and the wound is starting to close. I really hope this works and he is finally rid of this infection. It’s been over a year, with several times we thought it was clearing, only to have it bounce back.